Lynn Hershman Leeson's groundbreaking installation, performance, photography, video, digital, and film works have earned her an international reputation as a prodigious and innovative artist. This first historical and critical analysis of her work by prominent scholars and the artist herself brings nearly forty years of creative output into focus by tracking the development of her constant themes through each medium. The provocative essays in this volume, ranging from formal to theoretical to psychological to poetical analyses, establish her place at the forefront of contemporary art. Hershman Leeson's work explores vision, spectatorship, and the construction of sexed subjectivity, touching on key feminist concerns relating to the lived experience of the physical body and the body as a medium on which social law and values are inscribed. Her projects of self-analysis and self mythification explode stable notions of identity. 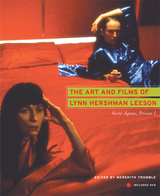 The Art and Films of Lynn Hershman Leeson demonstrates how Hershman Leeson's work uniquely mirrors fragmented human subjectivity at the beginning of the twenty-first century. Especially useful are the artist's updated chronology and a DVD with excerpts from several of her works. Lynn Hershman Leeson is Emeritus Professor at the University of California, Davis, A.D. White Professor at Large at Cornell University, and editor of Clicking In: Hot Links to a Digital Culture (1996). Meredith Tromble is visiting faculty at the San Francisco Art Institute and editor in chief of Art Contemporaries. Robin Held, currently Chief Curator at the Frye Art Museum in Seattle, is the curator of Hershmanlandia: The Art and Films of Lynn Hershman Leeson, a retrospective of Lynn Hershman Leeson's work.